We had our first foray into vintage Gucci bags, especially the Gucci Accessory Collection in this post. Likewise, we also discussed how to determine authenticity in vintage Gucci bags through serial numbers. You have also seen Gucci knight crest zipper pulls in the Gucci zipper section. Vintage Gucci bags are as ever as popular as the contemporary bags. Most people who begin with their Gucci journey inherit an item or two from yesteryears. These bags also are consistently listed on Ebay or other online selling platforms. In this section, I will be posting a couple of vintage Gucci bags, some of which are from the vintage Gucci Accessory Collection. The Gucci Accessory Collection is an interesting piece of Gucci history that was made from 1979 until the late 1990s. It has been widely available in airports and department stores. It will be interesting to look at the details on the hardware, leather and monogram print. Using less hardware and leather out of pigskin, the usual combination are: 1) navy GG monogram print + navy leather trim + navy/red web stripe details, and 2) beige/ebony GG monogram print + brown leather trim + red/green web strip details. The leather, being pigskin, has the distinct follicle marks; while fake Gucci Accessory Collection bag usually utilizes smoother cow skin leather and vinyl trims. A perfect example is the vintage fake clutch I have used back in 2007 (which is the starting point of my Gucci journey). Aside from the Gucci leather tag and serial number, some vintage GAC bags also have a paper tag beneath. But through use and old age, it is not uncommon to see these tags get removed. Here is an example of an authentic paper tag. Some authentic vintage Gucci bags also had a “G.GUCCI” engraving on their hardware, probably from the 1980s. As mentioned here, vintage Gucci linings tend to break down, so be attentive with the details of Gucci bags for sale on Ebay. When buying vintage Gucci purses on Ebay, always ask for question on wear and tear. Gucci bags stand the test of time, but they are not infallible. It is particularly not desirable to have a flaking lining and ruin your stuff. Next in the series, I will be discussing Gucci outlet bags. Hi! Is this the item ? Then, this is an authentic vintage Gucci bag! Hello thank goodness I found a site that shows great examples of authenticity. I have been researching for months and unsure of a purse that I purchased from a sale. I was wondering if my purse was authentic or not, it has a gold Gucci label with made in Italy and serial number also in gold, cross horsebit motif style. Hi Mai! For this free Gucci bag authentication, I will be needing clear photos of the Gucci bag, especially the Gucci marking inside the bag. Please upload on Imgur or Tinypic, and put the links in your comment. Hi! I have a beautiful Gucci bag that fits all of these requirements, perfect patten on the outside, all of the hardware has the imprinted logo, the inside of the bag is slightly shedding its lining, and it has a serial number. The only thing that concerns me is that the paper tag on my vintage Gucci accessory collection bag. In your photo Gucci is on top and the crest is dead center. On mine, Gucci is dead center and the crest is on top. Otherwise everything else is the same. The back of the paper tag is authentic and the leather tag is beautiful. Does this small difference on the paper tag mean it is not authentic? Hi! I have seen this type of Gucci tag that you described, but I can’t seem to find one from my own photo collection. If you could post a photo, this would be helpful but I see nothing to worry about. Cheers! This is an excellent guide to identifying Vintage Gucci! I wondered if you knew anything about the label “Gucci Parfum” that appears in some vintage Gucci clutches from the 1980s. Do you know anything about this label? It confused me that some small Gucci Bags have this label. I have only seen this label on Gucci clutches. Any info you have would be greatly appreciated! Hi! This is most likely given as free purses for Gucci perfumes. It also has the pigskin leather used on it. Kindly post a photo if you can. Cheers! I hope you are still keeping up with comments on here, because I really appreciate your tutorials and have an important question. Did Gucci ever made a blondie bag WITHOUT the big medallion on the front. I have on and everything looks so perfect except I couldn’t find single other one online that was the blondie style and did NOT have the medallion either attached or cut out on the top flap. Please help! Hi! Can you post a photo of the bag in question? Hi! Sure, you can post a link to the photos of your Gucci bag in the comments. Happy New Year from our side in the Pacific! Hi! To educate more people, I suggest making photos publicly available. Try uploading on Tinypic, then paste the URL/link to the photo in the comment. Cheers! Thanks so much for all your helpful tips for authenticating vintage Gucci bags. I’m new to the vintage bag scene but found what I believe to be a real vintage gucci bag from the 80’s for a steal of a deal. Would love your help in confirming if this bag is indeed authentic. I’ve included links to pics below. The serial number on the back of the tag is in a different format from the others that I’ve seen, but overall I believe the bag has many markings that confirm it’s authenticity. I recently received a Gucci accessory collection bag, it is in used condition, but I have no idea on the name of this bag, is it possible to send a picture to anywhere. For confirmation? Hi! Gucci Accessory Collection bags usually do not have a name. Cheers. Hi! I bought a vintage Gucci bag from an estate sale. Can you tell me is its authentic? I read all your articles….and I think its authentic,, however not totally sure. I was told that it was from the late 70s, possibly early 80s. It has the gold cursive logo. I haven’t seen that logo in your articles. Hi! The Gucci cursive logo can be seen in one of the case studies (i.e. Gucci Abbey) I had posted. But yes, I have seen vintage bags with this logo font. If you can post a photo, I could help you out. Cheers! Hi! Thank you for posting such detailed photos! It helps a lot in authenticating Gucci bags. Yes, this is an authentic vintage Gucci Accessory Collection bag. This still has the tyvek/paper material underneath. Congratulations! You’re help is priceless. I’m looking at 2 bags and I’m confused by their low price and great condition. I know that may sound silly, but I would rather know exactly what I’m getting. 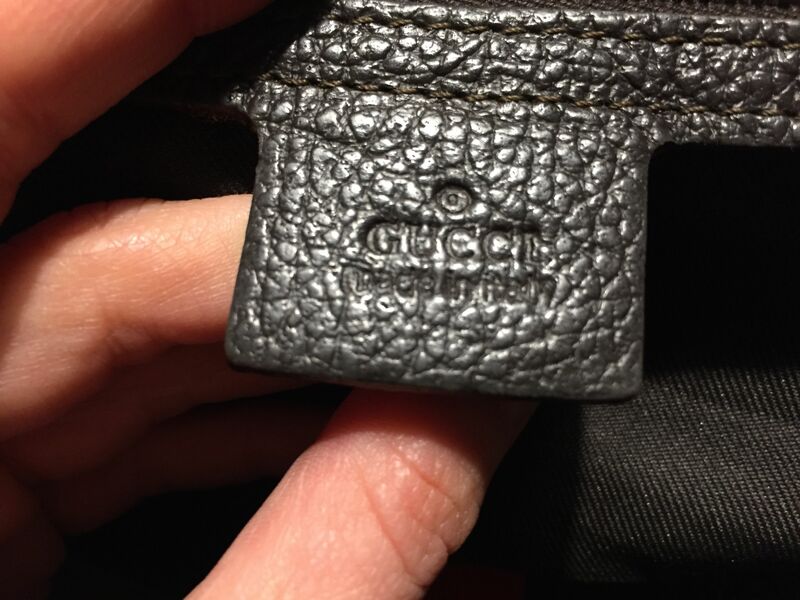 I bought a Gucci bag and I’m having a hard time tracking down solid info on it. Can you tell me if you know anything about it? It’s gucci monogram with knights zipper full and gold g closure. Hi! We need a photo of the bag to be sure. Several Gucci bags have the knight zipper pull in monogram. Cheers! Hi! This looks like an authentic Gucci Accessory Collection bag to me. Cheers! I don’t want to post a link right away, but I see a vintage Gucci online… Everything seems to check out and even has this red drawstring pouch included… But the buckles lack GG symbol. Hi! Photos would help to authenticate a Gucci bag. Cheers! HI I hope you can help I wanted to find out if this is a authentic bag ? Hi! It would help to see a photo of the serial number. Cheers! Hi! Needs a photo of the serial number and the Gucci tag to be sure. Cheers! Hi! These are both authentic Gucci bags from the 90s. These is an entry for it here. Cheers! Hi! This is an authentic vintage Gucci Accessory Collection monogram sling bag. Cheers! Hi! This is an authentic vintage Gucci Accessory Collection bag. Interestingly, Gucci launched a bag for Spring/Summer 2018 called Gucci Ophidia bag inspired by this style. I have pictures of a Gucci handbag that I found. Is there a way I can upload them to be checked? Thanks. You may use Photobucket or Tinypic to upload the photos and paste the link here. Cheers! Gucci is my favorite brand. Like all product in Gucci brand. You share the Gucci vintage bags are really awesome. I found lots of interesting information here. The post was well written. Thanks a lot for this beauty Enjoying article with me. I appreciate it very much! Hi! Thank you very much! I also have a soft spot for the brand, as I look forward to more people obtaining crucial information to determine between a fake and a real one. Cheers! Hello! Are these real Gucci bags? Hi! All three vintage items are authentic Gucci bags. Cheers! Do all Gucci vintage bags have markings including strap buckles and handles? 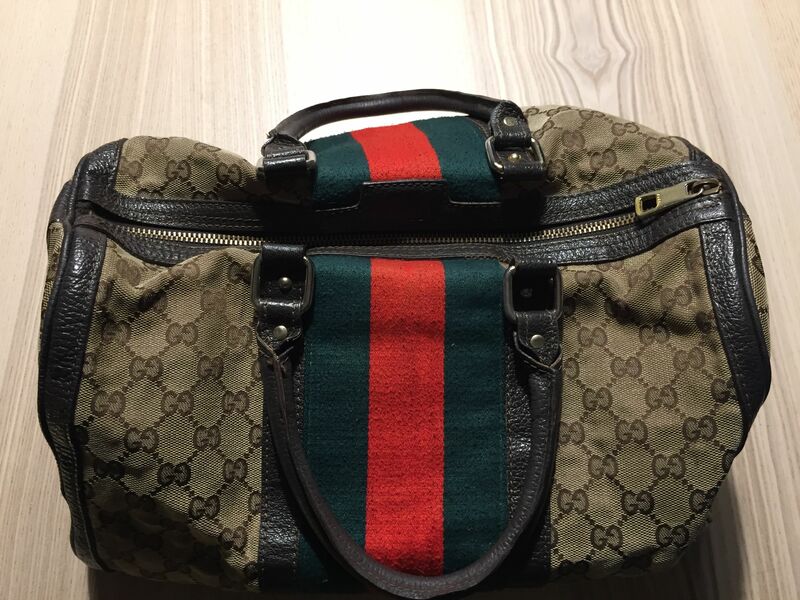 I am interested in buying this vintage Gucci bag from a seller on eBay, but I need your expertise to let me know if it’s authentic 🙂 your help would be greatly appreciated! Hi! This is an authentic vintage Gucci Accessory Collection reporter’s bag. Cheers! I have this vintage GUCCI bag and I would appreciate your opinion concerning authenticity. Thanks! Hi A PAO! I think I have already replied to another post of yours. Anyway this gorgeous vintage bag is an authentic Gucci! Cheers! I have this vintage GUCCI bag and I would appreciate your opinion concerning authenticity. Thanks a lot! Hi A PAO! I believe that this vintage crossbody bag with serial number “001.090.0487” is authentic. Hi! This is vintage Gucci bag with serial number 001.090.0487 is authentic, not to mention, very gorgeous! Congrats! Hi- really appreciate the detail you put into this post. I have a vintage Gucci bag I got from my mom and it seems some of the marks of authenticity are there and others not. Could you weigh in? Hi Emily! In my opinion, this vintage Gucci monogram bag with serial number 001.0791 is authentic. 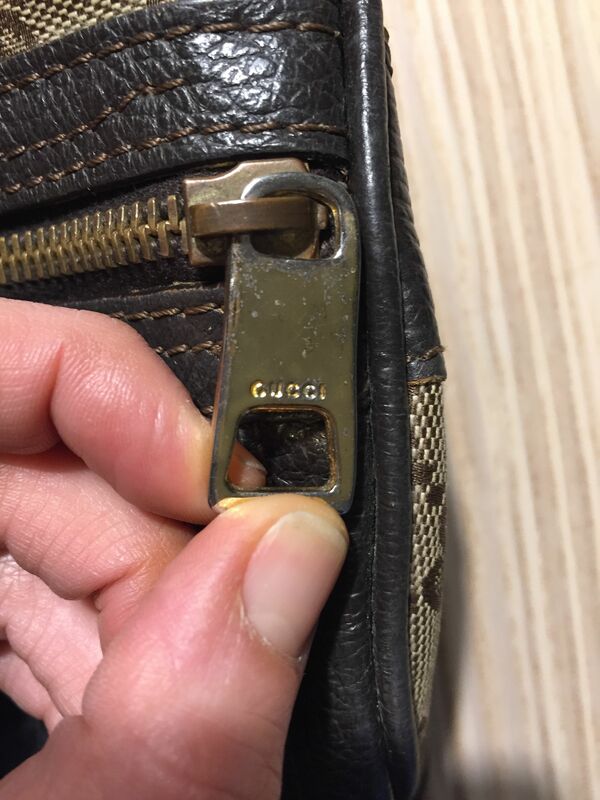 You may also refer to this post discussing Gucci zippers (https://bagaholic101.com/ultimate-guide-tell-gucci-bag-real-fake-gucci-bag-zipper/) as it has the same gold Gucci knight zipper pull. Cheers! Thank you!! Really appreciate your help! You are very much welcome, Emily! Hi Meyjune, please upload photos of your Gucci bag on Photobucket or Tinypic and paste the url/link here. Cheers! Hi Jenna, somethings is off with the bag. Dear Bagaholic 101. I was told this bag was GUCCI but it misses out on lining, capitals, Registration mark and serial number. So I assume that it is fake? Hi David! I need to see photos of inside the bag. Cheers! Hi David! Yes, this is an authentic Gucci bag. Hi Sierra! This vintage Gucci Accessory Collection monogram bag with serial number “56.02.004” is authentic. This is reminiscent of the current Gucci Ophidia Camera bag by Alessandro Michele. Cheers! Hi Yeet! This vintage brown Gucci monogram canvas tote with serial number “39.02.003.” is authentic. Hi! I bought a Gucci Accessory collection bag at an antique store but there is no serial # on it. Does it mean it’s fake? Thank you and have a great day! Hi Gino! Not all Gucci bags will have a serial number. Please post photos of the bag in question to authenticate. Cheers! What do you think about this vintage clutch? I was assuming it was fake. Hi Chandra! This is an authentic vintage Gucci Accessory Collection monogram clutch. Cheers! Hi could you give me your opinion of this bag I’m thibking of buying? I hope it’s authentic! Hi Chloe! Needs more photos of this vintage Guccu bag to authenticate. Cheers! Hi I was just given a what sems to be vintage gucci clutch as a gift!! Can you please tell me if it’s real or fake and if so, the year it could be and the cost? Hi Morgan! Please upload photos on Imgur or Tinypic and paste the links here for me to check. Cheers! My wife bought a gucci vintage access collection crossbody, we have a suspicion it might not be authetnic. The buckle on the strap has mongram. The mongram at the front is slghtly tilted. & the zipper labels is dark organgy instead of gold compared to the the other metal. The metal on the 2 sides the bag that holds down the straps has no monogram on it either. May we send pics to you? Do you have a seperate email address for pictures? I’d like to act fast so that credic card doesn’t process the payment. Is there going to Gucci flagship in NY? Can they give an opinion? Hi Sanoj! Please upload photos on Imgur or Tinypic and paste the links here for me to check. Cheers! Thanks so much for sharing all of your knowledge! I am now convinced my mega barging today is a major jackpot!! Bought 2 blue monogram vintage bags at an estate garage sale for $7.00, yes SEVEN bucks!!! I’m beyond excited! Hi Nydia! That’s such great news! I always love to hear readers score a bargain because of this real Gucci bag authentication guide! Thank you so much for your comments on my Gucci bag “001.090.0487”, I appreciate your help! I have a vintage crossbody Gucci bag without any serial numbers inside, probably from 1970. The new Ophidia bag resembles this style very much. It appears to be identical to the one you have featured in your page about Gucci authentication. Can you please help me confirm that this is 100% authentic. I uploaded the photos on Imgur. Not sure if I provided all the information you may need. Sorry, here it is one more time. I am looking for your help to authenticate the Vintage Gucci crossbody bag. I posted the photos on imgur, https://jtyles.imgur.com/all/. I have more photos if you need to see. It does not have a serial number, stitching is not perfect. Hi Julie! Yes, this is similar to current Gucci Ophidia camera bags, and those from the vintage Gucci Accessory Collection also have this. Nevertheless, this is an authentic vintage Gucci bag, likely from the 1970s. Hi there, just recently purchased this bag on Poshmark. Tried to search for this vintage piece, but unable to locate online. Can you take a look. 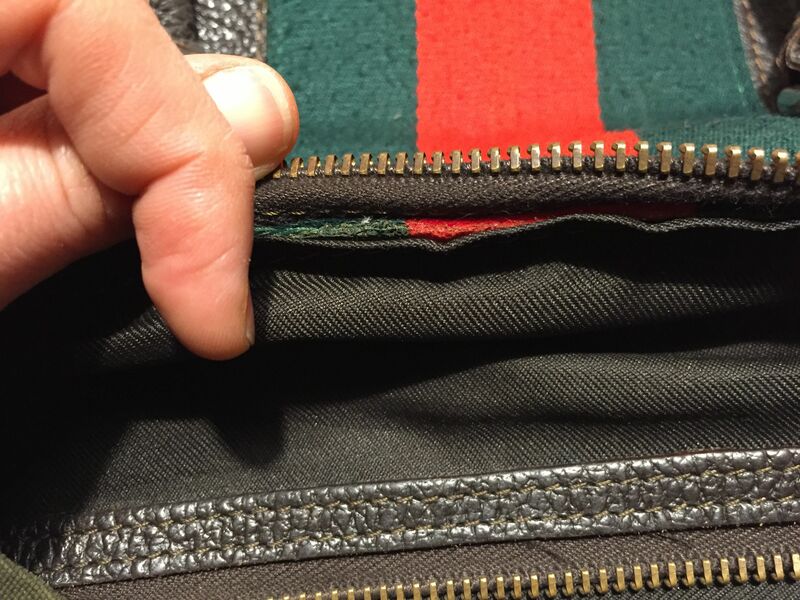 I’m not seeing logos on the D-ring and zipper is not YKK and the logo is not exactly matching up with anything I’ve seen. But then again here’s been so many variations! Here’s the link and I can provide more photos if needed. Hi! This is an authentic vintage Gucci bag. Hi JG! This is an authentic vintage Gucci bag. Cheers! Hi again! I hope you are doing well ! Today I’ve got a Gucci belt which was given to me many years ago by my late aunt (it was hers). I never used it and now I want to know if it is authentic, in fact, there isn’t any serial Nr. on it and this looks to me a little weird… On the other hand, I know she used to shop high end brands and she never bought any fakes. Apart from the first 17 styling photos which I had previously made for my files, I made some more (photos 17-25), focused on the details that may be useful to you. That’s good news. Thanks a lot for your help, once again! I may be back with some more questions…. You’re welcome, A PAO! Always happy to help! I am in the process of purchasing this bag and was hoping you could authenticate. Hi Nicole! This round vintage Gucci monogram bag with serial number “007.115.5575” is authentic. Cheers! Hi, can you help me verify if this bag is authentic? Thanks so much for your help! Hi Beth! 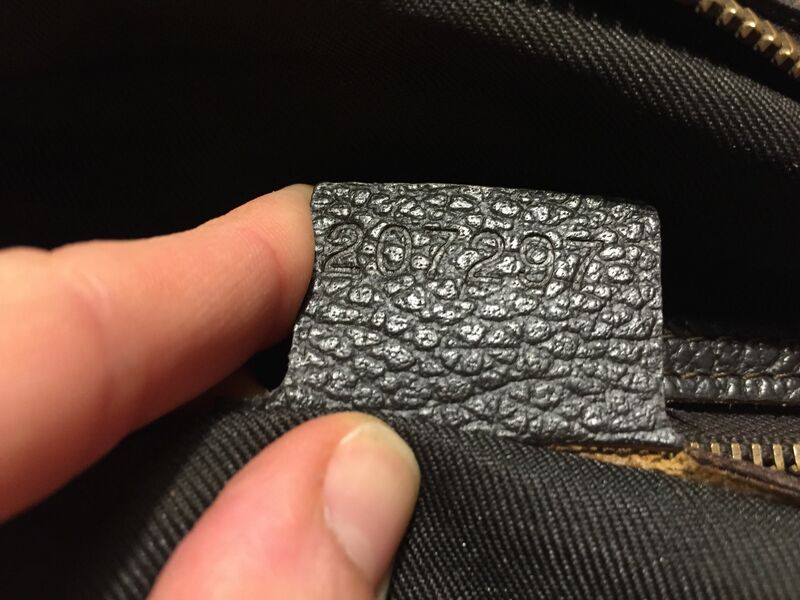 Do you have a photo of the Gucci leather tag and serial number? Kindly post so I can help. Cheers! I was having difficulty uploading images. I hope that this will go through. Thanks so much! Hi Beth! This vintage Gucci Accessory Collection monogram bag with web stripe and serial number “89.02.066” is authentic. Cheers! I bought this bag and I have tried to do my research on being fake or real and I keep assuming fake but I’m not 100% sure. Can you help please! Hi Michelle! I will be needing clear photos of the Gucci bag to authenticate, especially the Gucci tag and serial number. Please upload on Imgur or Tinypic, and put the links in your comment. Cheers! Hi Maria! I will be needing clear photos of the Gucci bag, especially the Gucci tag and serial number. Please upload on Imgur or Tinypic, and put the links in your comment. Cheers! Hi i really hope I did this right I really could use help finding out if this gucci bag is authentic and maybe find out from when. I was told it was an anniversary collection from the person who gave it to me but I’m not sure, so if you could please let me know whatever you can I would very much appreciate it thank you so much! Hi, I have an authentic Gucci bag purchased on Worth Ave in Palm Beach in the ’80’s. I need to sell it and have looked for one like it, but can’t find one. Can you tell me how to value it? Also, how will I prove that it’s not a fake? Hi Cheryl! We usually do not comment on a Gucci bag’s value, as it is relative to the the individual selling it. For this free Gucci bag authentication, I will be needing clear photos of the Gucci bag, especially Gucci marking inside the bag. Please upload on Imgur or Tinypic, and put the links in your comment. Cheers! Hi Lisa! This is a GORGEOUS vintage Gucci monogram bag! If you check this link here GUCCI HERITAGE, ICONS, AND BEYOND: EVOLUTION OF THE GUCCI TRADEMARK, this number usually appears next to the Gucci crest and GUCCI ITALY! This also has the diamante lining. I am jealous! Cheers! P.S. Would you mind if I include this in that link? This will be helpful to others searching for information on vintage Gucci, too! Hello! Please could you help me with an authentication? It’s a vintage bag I have recently bought and unfortunately I have noticed some signals that it could be fake (as some imperfections in the inner lining). Thank you so much for the amazing work and help you are doing on this platform! Hi Tun! This Gucci boston bag with red and green strip and serial number “207297” is unfortunately fake. Hello! I wanted to double check that this bag was authentic before purchasing it from a seller. To me, the symbol looks a tad wonky but a second opinion would be much appreciated. Thank you! Hi! This page has been super helpful! I bought a huge lot of purses at a yard sale and was excited when I found a Gucci purse but after your page I’m pretty sure it’s fake. Thought I’d see if you wouldn’t mind confirming though before I scrap it. I could not find a serial number anywhere. Thanks so much! Hi Nicole! Yes, your suspicions are correct. This is a fake Gucci bag. Cheers! Hi, if you can kindly help me verify if this is an authentic Gucci bag. Appreciate you so much! Hi Vanessa! This brown vintage Gucci Accessory Collection monogram canvas purse with serial number “66.001.4461” is authentic! Cheers! Hi Darlene! This vintage Gucci belt is authentic! Hi, is this an authentic vintage bag? Thanks for your help! Hi Kellye! This vintage Gucci boston bag is, unfortunately, fake. Hope you find an authentic one, Cheers! Hi, I wanted to know if this was authentic. Thank you so much! Hi Vanessa! This vintage monogram Gucci Accessory Collection purse with removable strap and serial number “66.001.4461” is authentic. Cheers! Hi Vanessa! Items marked with “GUCCI PARFUMS MADE IN ITALY 38” or even any other number are possibly given as gifts. They are not the same as the Gucci main line nor the vintage Gucci Accessory collection items. Hi! I was hoping you could look at this bag to see if it’s authentic or not. Not sure if my other comment posted (sorry!) Everything looks like it might be but I don’t see a stamp on the D rings on the straps? Hope it is real! Got it for $5! Hi Christina! All comments are under moderation to filter spam. This vintage monogram Gucci Accessory Collection with serial number “904.002.005” is authentic! Cheers! Hi Polina! This Gucci monogram bag is unfortunately fake. Hi! Can you help authenticate? Hi Ashley! For this free Gucci bag authentication, I will be needing clear photos of the Gucci bag, especially the Gucci marking inside the bag. Please upload on Imgur or Tinypic, and put the links in your comment. Hi Suzana! This Gucci Babouska in Black Python Leather bag with serial number “207298 212792” is authentic. This is from the Gucci Fall/Winter 2008 collection. Cheers! Hi could you help me if this is authentic from the vintage Gucci accessory collection? All signs show yes but I love a second opinion! HI Manda! This vintage monogram canvas Gucci Accessory Collection bag with serial number “904.02.050” is authentic. Cheers! Hello! I just bought this vintage hang bag. The leather is a harder but smooth. The hardware on the outside does not have any embossed G’s, and the zipper inside only seems to have three lines along side and blank on the other. It’s in excellent condition. Is it real? Good evening. I recently acquired this bag via a storage auction and I am the furthest thing from a bagaholic though I hope you will still entertain my request. I see what I would consider some red flags but the bag seems well built overall. I assume since there is no serial number tag that my only hope is that this is a vintage bag. Any insight will be appreciated. Thank you. Well my iPhone doesn’t seem to want to cooperate with posting photos. If there is another way please let me know. Thanks again. Hi Matt! This vintage monogram Gucci bag is actually authentic! Hi Jacki! You may try BAGAHOLIC 101’s Gucci bag authentication service for only a minimal fee of US$ 5. More information here: https://bagaholic101.com/gucci-authentication-service-by-bagaholic-101/ . Cheers! Good day! Could you help me check if this is authentic from the Vintage Gucci accessory collection? I’m not too sure about the hardware, especially the one on the first pic. Thanks so much for your help! Hi Liz! This vintage Gucci Accessory Collection bag with serial number “89.02.032” is authentic. Cheers! HI there – can you please have a look at these bags and let me know what you think? Hi Cathy! These vintage Gucci Accessory collection bags with serial “56.02.087” and “89.01.031” are both authentic. Cheers! I have bought a Gucci messenger bag but I am not sure if it is real or not. Could you please help me and tell me if the bag is original? Thank you for your generosity with all of this information! I inherited a vintage Gucci bag and have tried to do my own research as far as the age/style but I’m running stuck. Do you have an idea of when this bag was made and what the style is called? Hi Anne! You may try BAGAHOLIC 101’s Gucci bag authentication service for only a minimal fee of US$ 5. More information here: https://bagaholic101.com/gucci-authentication-service-by-bagaholic-101/ . Cheers! Hello! I just bought this off Poshmark… can you help me to determine authenticity? Thank you so much! Hi Alyssa! You may try BAGAHOLIC 101’s Gucci bag authentication service for only a minimal fee of US$ 5. More information here: https://bagaholic101.com/gucci-authentication-service-by-bagaholic-101/ . Cheers! Hi! This website is amazing! I just bought this GAC bag of Poshmark and can’t seem to figure out if it’s real or not. Both leather and paper tags with serial numbers are present but since it’s a vintage, I’m doubting myself. Hi Mariya! You may try BAGAHOLIC 101’s authentication service for only a minimal fee of US$ 5. More information here: https://bagaholic101.com/gucci-authentication-service-by-bagaholic-101/ . Cheers! Hi! I have read your blogs on the vintage accessory collection but I am a little confused as the item I am looking at is a purse accessory and not a purse. I have scoured the internet and not found another item like it which scares me. The person selling it is not even sure of its original purpose and I’m not sure where else to turn. Thank you for any information you can provide. Hi Amanda! Thank you for finding this website helpful. For a stress-free buying, you may try BAGAHOLIC 101’s Gucci bag authentication service for only a minimal fee of US$ 5. More information here: https://bagaholic101.com/gucci-authentication-service-by-bagaholic-101/ . Cheers!